Snapseed (Android) ~ Android Forever! Developer Quote: "Now the Best Mobile Photo App of 2012 (TIPA) and iPad App of the Year 2011 is available on the Android Platform!" Check it out! This amazingly powerful and versatile app has been beloved on the iPad, but now you can get it FREE on your Android device. 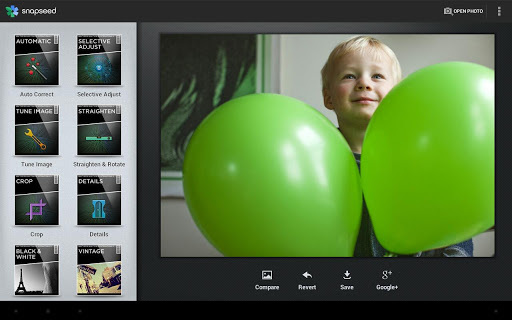 With tons of enhancements, editing tools, sharing options and more, it will be the only photo app you'll ever need. • Auto Correct - Automatically analyzes your photo and adjusts color and exposure to perfection. • Selective Adjust - Make precise selections and enhancements to specific areas of your photos in seconds with Nik Software’s revolutionary U Point technology. • Tune Image - Use Ambience to create depth and vibrancy that uniquely adapts to colors and textures. Adjust White Balance, Saturation, Contrast, more. 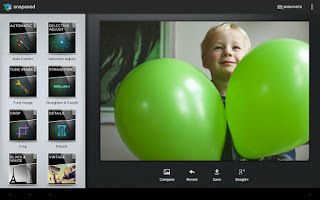 • Straighten & Rotate - Rotate 90° and/or straighten photos with simple gesture controls. • Crop - Easily crop images to remove distracting parts of your photo with standard aspect ratios, or a free crop.